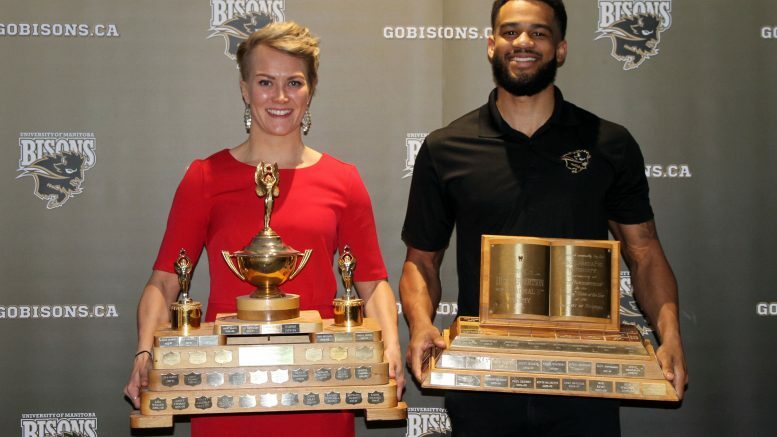 Venla Hovi of the women's hockey team and Justus Alleyn of the men's basketball team were named Bison Male and Female Athletes of the Year on Saturday. The 2018 U SPORTS National Champions Bison women’s hockey team cleaned up at the annual Brown and Gold banquet on Saturday. Bison head coach Jon Rempel took home the Bison coach of the year award, rookie goalie Lauren Taraschuk won Female Rookie of the Year, and 2018 Olympic bronze medalist Venla Hovi was named the Bison Female Athlete of the Year. Brendan Warren from the men’s volleyball team was named the Male Rookie of the Year and Justus Alleyn from the men’s basketball team was named the Bison Male Athlete of the Year. Alleyn saved some of his best basketball for his last season The fifth-year guard won the Canada West scoring title, averaging 24.1 points per game. It was the first time any Bison player had won the Canada West scoring title since Manitoba joined the Canada West in 2000. Alleyn made even more history by becoming the first Bison since 2000 to be named a Canada West first team all star. To cap it all off, he has been selected to represent Canada at the 2018 Commonwealth Games in Australia this summer. Hovi added more hardware to her mantle, being named the Female Athlete of the Year. The Finn won Olympic bronze in PyeongChang in February and dominated the competition at the U SPORTS National Championship one month later. Hovi finished the year with four goals and eight assists in 12 regular season games. Hovi assisted on the all-important goal sending the Bisons to nationals in the fourth overtime against the University of Alberta in the Canada West semifinals. She also scored the second goal in Manitoba’s 2-0 win over the University of Western Ontario in the national finals. Weeks after capturing both the Canada West and U SPORTS Coach of the Year honours, Rempel was named Bison Sports Coach of the year for 2017-18. In his 14th season behind the Bisons bench, Rempel led his squad to a number one national ranking, conference championship, and national championship. Rempel guided the Bisons to a 19-5-3-1 record in the regular season, finishing first in the Canada West. One of the many rookies starting this season for Garth Pischke’s squad, Warren was able to have an immediate impact. The six-foot-six middle blocker was one of the best blockers in the country in just his first season. Warren averaged 1.27 blocks per set, placing him third in all of U SPORTS. He was also named to the Canada West all-rookie team. Even though Taraschuk missed out on being named the U SPORTS Rookie of the Year, the rookie netminder was instrumental in Manitoba’s championship season. The graduate of J.H. Bruns went 7-0 during the postseason with a 0.57 Goals against Average. Taraschuk finished the regular season with a 0.71 GAA which led the Canada West, and a .961 save percentage and finished with five shutouts. She only allowed more than one goal on two occasions in regular season and playoffs. 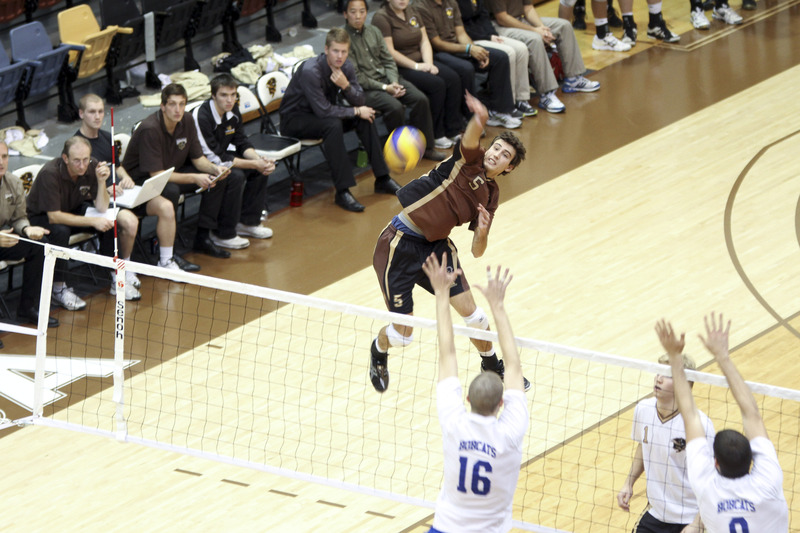 Taraschuk won the Canada West Rookie of the Year and was named to both the Canada West and U SPORTS All-Rookie teams.